Fresh cherries and peaches with fresh lime juice. Banana peppers make this a mild, kid friendly salsa that is great with chips. My neighbor called me the other day to let me know she was 30 minutes out with half a cow [and did I want any?]. The kids and I sprang into action, defrosting the meat freezer and making room. Since I was on a roll with defrosting freezers, I continued the following day by defrosting my fruit and vegetable freezer aka microwave stand. I'm happy to report that all freezers are humming along happily. One way to enjoy local food year round, when you don't live in a place like California or Hawaii where things grow year round, is by freezing plenty when it is ripe. Each summer I put up berries, stone fruits, corn, beans, tomatoes and peppers to enjoy in the winter. In my rush to get enough fruit squirreled away I rarely stop to enjoy fresh fruit. This salsa is one exception. 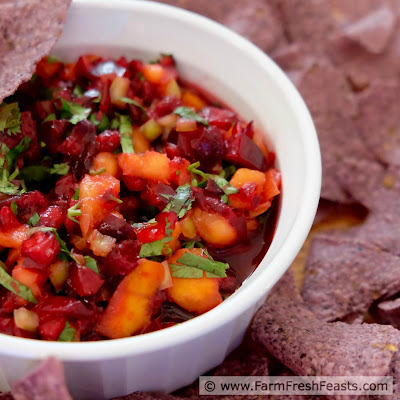 Fresh cherries and peaches, combined with the bite of banana peppers, makes a mild and fruity salsa. We enjoyed this with blue corn chips for the full Eat The Rainbow extravaganza. It dressed up the leftovers of our anniversary Mexican take out. 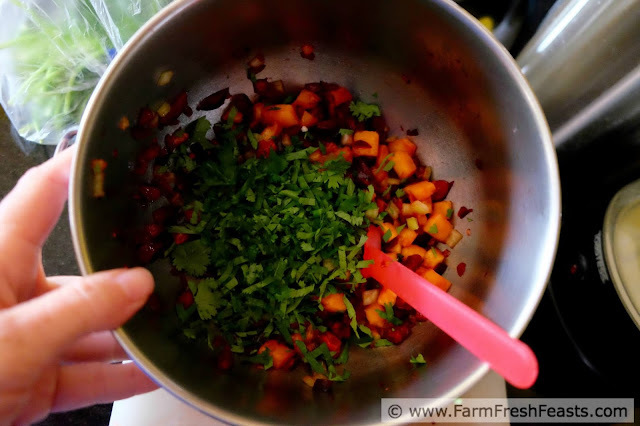 I added kernels from an ear of cold cooked corn to the remainder for a fruit-veg salsa combo--also good. For other recipes using cherries, please see my Cherry Recipes Collection. For other recipes using peaches, please see my Peach Recipes Collection. For other recipes using banana peppers, please see my Pepper Recipes Collection. These collections are part of the Visual Recipe Index by Ingredient, a useful way for folks like me eating seasonal abundance from the farm share, the farmer's market, or the generous gardener next door. I've got a Fruit board on Pinterest, but I'm also going to pin this to my Awesome Veggie Apps and Snacks board because I think it fits. In a large bowl, toss lime juice and cherries. Gently add peaches and peppers and toss again. Sprinkle with cilantro and salt, toss a final time. Let flavors hang out for 30 minutes at room temperature before serving, or chill for up to 4 hours before pulling out to serve. Use this within a day or two or else the peaches will turn to mush. 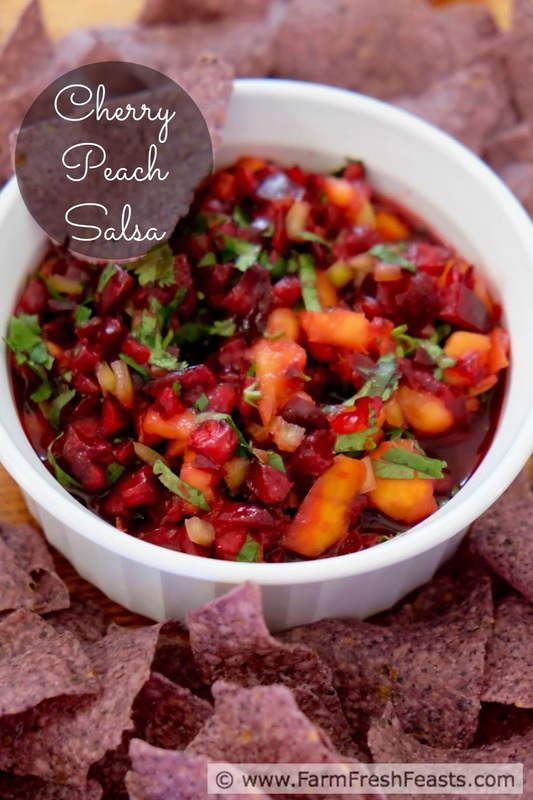 I'm all about fruity salsas! I just realized that I don't have herb scissors.... If I end up getting some, I'll be sure to click on your Amazon link! We like to do stockings at Christmas, and I often check the local grocery store for ideas, then give the kids an assortment of options. The herb scissors were in my stocking one Christmas (though it took me a good 8 months to realize that the storage case was also the cleaning comb!). I want my neighbor to give me that same call! 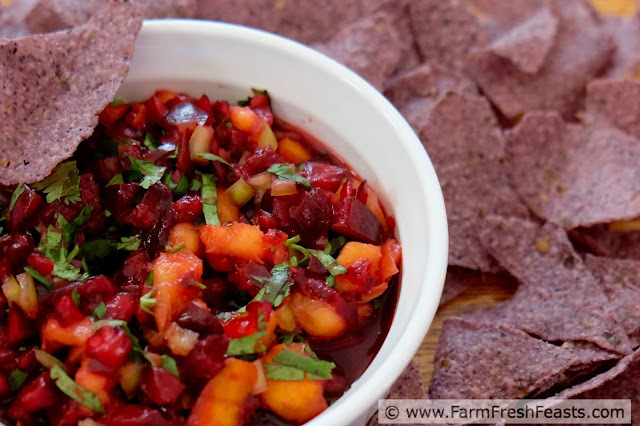 Love this summer salsa. It looks wonderful! I cannot tell you all the ways I am grateful to have such awesome neighbors. My little 'hood really rocks! Beautiful! 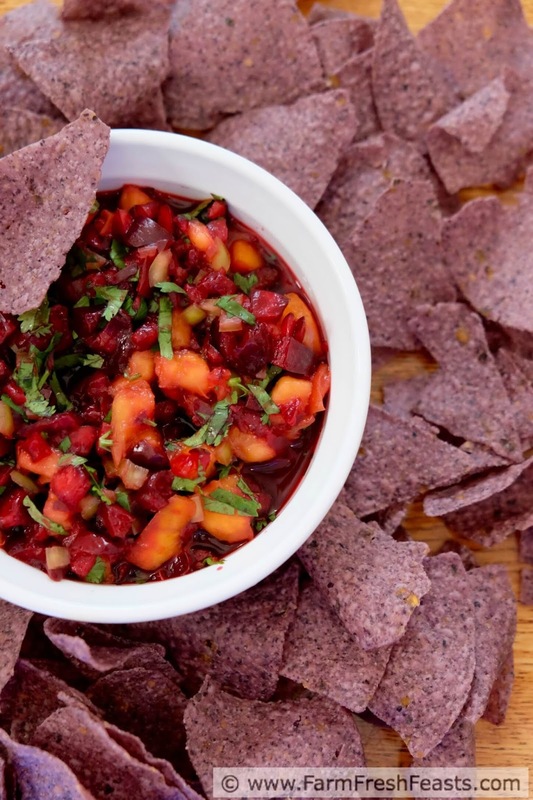 And even the purple chips harmonize with this healthy salsa! This is such a great time of year for produce and we've been enjoying the fresh cherries and peaches among other things. I've pinned this recipe to share. My spouse is such a fan of these purple chips I was glad they were handy for the contrast in the photo. Be still my fruit loving heart. I adore the flavor combinations in here maybe because summer fruit. Also, I defrosted my chest freezer this weekend. Speaking of which...I think it's time to plus that bad boy back in so I can put it to use. Right now, everything is in the upstairs kitchen freezer, which means its a mess to find anything. I think I'm about done putting up fruit at this point (got a few late peaches at the farmer's market to slice and freeze, but everything else is in) and it's time, again, to reorganize! absolutely dislike cilantro....what other herb would you recommend? I understand that--cilantro used to taste like soap to me but now I find I like it. I'd use some flat leaf Italian parsley instead.